- Topla and Ladna Valovnica – hot-strip and cold-rolling mills. 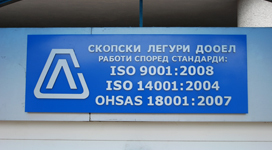 As a result of the economic conditions in Macedonia after separation from Yugoslavian Federation in 1991, the Metallurgical complex Rudnitsa and Zhelezarnitsa was restructured in 10 brand-new independent legal entities, all of them under former metal mill. One of the respective companies, namely Topilnica, was reconstructed for the ferroalloy production. - 2006 - Skopski Leguri DOOEL was reconstructed for manganese ferroalloys manufacture (silicomanganese). - 2008 - manufacture line for ferronickel was designed and prepared for start-up. - 2010 - the manufacturing company made own investment expenditures for Electric Arc Furnace №1 for ferronickel production.